In her first visit to Stanford since she graduated in 1994, Rachel Maddow ’94 brought a mix of policy acumen, humor and sarcasm to a packed Memorial Auditorium on Saturday evening, arguing for a greater emphasis on rigorous humanities disciplines and advocating a more empathetic relationship between civilians in America and combat forces abroad. “Drift” argues that American involvement in conflicts abroad has become more secretive and less transparent over time and that the burden of war on American society has become spread increasingly unequally over the last few decades. Maddow spoke at length about the need for civilians to engage the military in a more active and empathetic way. Introduced to extended applause and a standing ovation, Maddow began the talk with a discussion of her Stanford experience, her intellectual formation at the University and her work on HIV/AIDS advocacy. One of the steps towards realizing that goal was her enrollment in the Honors Program in Ethics and Society. “Apparently they’ll keep ripping it apart for 15 years,” she added, noting that her own thesis is regularly given to students to critically assess for themselves. Having graduated from Stanford with a degree in public policy, Maddow continued her studies at Oxford University as a Rhodes Scholar. 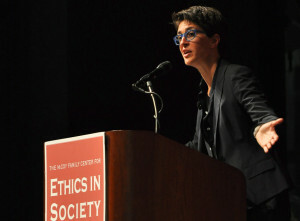 While Maddow said that she recognized the intellectual value of her education during her time as an AIDS activist, incorporating fields as disparate as philosophy and statistics, she noted that she had never been enamored socially with her Stanford experience. “While I was here, I was alienated and annoyed, and, honestly … I was out as a freshman, and there was one other person who was out,” she reflected. Released last year, Maddow’s book argues that military expenditure has become detached from realistic needs and that America increasingly goes to war without a societal appreciation of war’s costs and consequences. Maddow framed her ideology as one that appreciates the need for a robust military but argued that a dysfunctional weapons procurement process has hindered and compromised America’s military readiness and strength. She also argued that the means by which the United States prosecutes conflicts has also changed to become more secretive and more clandestine, in an occurrence that she stressed was strictly nonpartisan. Maddow then spent time discussing the burden of war as applied to society as a whole, arguing that only a small portion of American society truly feels the costs of war and that those that do not absorb those costs are additionally insulated from those that do. Noting the many ways in which media, sporting and corporate advertisements acknowledge the sacrifices of soldiers and their families, Maddow said that she does not disapprove of such pronouncements of military support. She argued, however, that they are far from sufficient in capturing the true extent of the debt owed those in uniform. Maddow then took questions from Rob Reich M.A. ’98 Ph.D. ’98, professor of political science, and members of the audience on topics as diverse as the progress of gay rights — which Maddow attributed to the argument against gay rights having “gone out of intellectual fashion” — to her residential experiences at Stanford. Maddow lived in Paloma, Chi Theta Chi and Columbae over her three years at the University. Maddow advocated the humanities in a vigorous defense of so-called “fuzzy” majors and, showing a disdain for interdisciplinary programs, stressed the need to study courses focused narrowly on one domain. After Maddow left to a second standing ovation, Jacob Kovacs ’13 said that he was impressed not only at her humor and intelligence but by the depth and profundity of her talk. While Maddow’s talk touched on a variety of subjects, she appealed regularly to the refrain that Stanford offers an experience that cultivates one’s faculties in a deep and targeted way and hones one’s abilities to persuade and to argue.